Your Prom night or formal dance is one of the highlights of the school year. From the decorated venues and music to long dresses and fancy suits, it is the perfect way to finish School and celebrate with your friends before everyone moves on. Now there is something that can make your night extra special, the Taxi Snap Photo Booth! This unique addition to your Prom allows your guests to be their own photographer by stepping inside an iconic British taxi. The Taxi Snap Photo Booth is a real vintage taxi that once ran through the streets of London, which has been specially refurbished on the inside and out to make it into a quirky and fun photo booth. Is there anything more British than a London taxi? In the inside of the cab, there is the latest technology; from a DSLR camera and the latest printing technology to an interactive and user-friendly touch screen, Prom guests can take photos and make videos with the touch of a button. With all the latest technology in the vintage taxi, it is easy to take quality snaps and shoot HD videos. There is a modern and interactive touch screen in every taxi that faces the passenger seats, allowing guests of all age to set up their Prom snaps. It is user-friendly and allows you to retake and zoom, as well as having a count down timer on screen to take the perfect snap. Say Cheese! All of the photographs taken in the taxi are of a superior quality compared to ordinary photo booths. Images are taken with a DSLR camera, which ensures they are sharp, clear and high quality for Prom guests. It is like having a professional photographer at your venue! There is also the latest sub dye printing technology, which produces 2 x 6 photo strips that make great mementos to take home. After the Prom, all of the photographs can be put onto a USB stick, so you can relive the evening all over again. In addition, the images can be uploaded to a secure link online. They are password protected, which allows you to only share the JPEGs from the Prom with guests that were there. Not only can you take photos in the vintage British taxi, but now you can also take make funny videos too! Technology allows high definition 1080p video recordings from inside the taxi, where you can make hilarious clips that you can send to your friends or share on social media. Have fun with your friends and wear amusing hats, oversized glasses and hilarious moustaches to pose for photos. What a great way to accessorise with your Prom outfit! A prop box is included with the Taxi Snap Photo Booths, which is sure to entertain guests for hours. It is easy to share photos and videos live from the Prom venue and make sure everyone knows it is a special night. All of the images and videos can be shared via popular social media sites, such as Facebook. 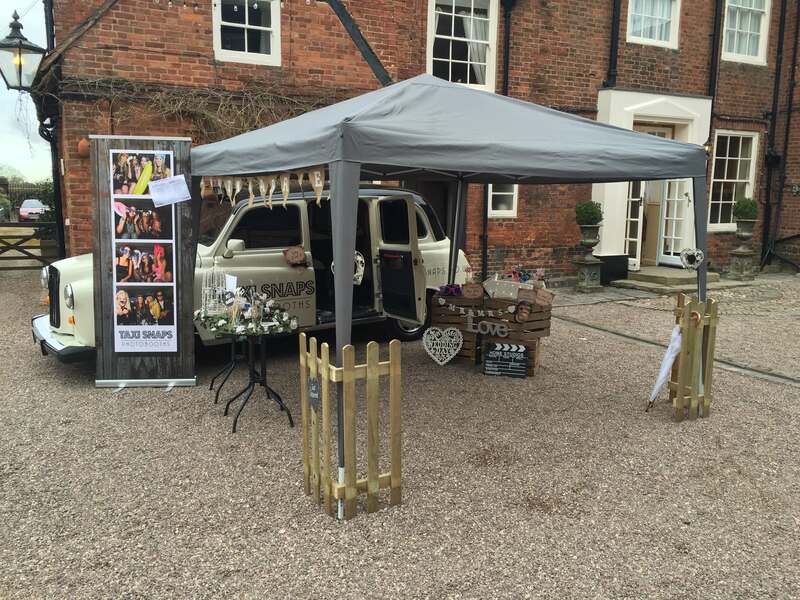 If you love the sound of the Taxi Snap Photo Booth and want to make sure it arrives at your special Prom night, hail one of our vintage cabs today to bring fun, laughter and memories!